AEH is in possession of more than 100 trucks. 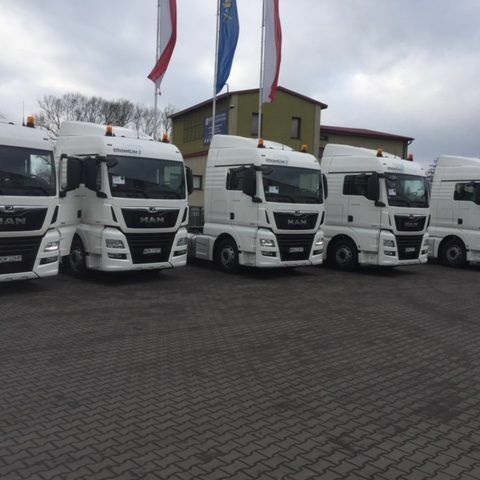 We are using EUR 6 models from Volvo, MAN, Scania, Renault and Mercedes vehicles and a range of different types of trailers, such as tarpaulins, refrigerators, walking floors, dump trucks and bulky low-floor trucks. We offer both two-axle and three-axle vehicles with hydraulics needed for the use of semi-trailers such as walking floor. We employ qualified drivers whose skills are regularly tested by our company and other various institutions. The driver education that raises their qualifications and our clients’ satisfaction is our priority. Please contact our road transport for offer! Our company is effective in transportation of dangerous materials according to the ADR convention. We have considerable experience in this field and the dangerous goods safety advisor watches over the fulfillment of all the necessary norms and looks after correctness of all regulations. Apart from ADR materials transport, AEH is in possesion of waste transport permits for most groups of materials in all European Union countries. This means we can transport waste to and from anywhere within European Union. Many years of existence on the transport market enabled us reach new challenges and goals. We are willing to undertake cooperation with new contractors and conquer new markets. Please contact our road transport for offer. You benefit from our high experience in delivering cargo in the complex European supply chain. You benefit from every innovation that we apply in our company, our vehicles are constantly replaced with new ones and our drivers are trained. Team of our experienced dispatchers will give you an outstanding support, and are ready to apply their passion for solutions in support of your transport.